Dr. John and Wendy have a discussion about the idea of pre-heating the patients in our chair. Treatment planning is a common trouble area within offices that we, as clinicians, are doing EVERY DAY. Are your treatment philosophies in line with everyone in the office? Patients may be suffering because treatment planning procedures are not in line, and things are missed. 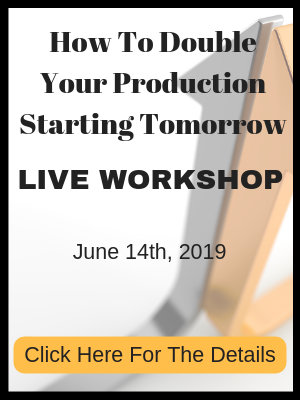 Listen in to these crucial key points that if done well, can increase production potential immensely, tomorrow! Learn to HELP your team members, and protect your employees and YOUR sanity! [music] Welcome to the Double Your Production podcast with the Team Training Institute, the one place designed for dentists and their staff who want to grow their practices by following in the footsteps of those that have done it, who are in the trenches, who know exactly what you’re going through. And now your leaders, the stars of the podcast, Dr. John Meis and Wendy Briggs. Welcome, everybody to this episode of the Double Your Production Podcast. I’m Dr. John Meis, and with me is the amazing Wendy Briggs. Wendy, how you doing? I’m great. How are you, Dr. John? I’m doing super. We had a funny thing happen to us this week. Occasionally, we’ll look on social media into some of the dental groups. And I always have to do that in very short, short, short spans of time because I go crazy about some of the foolishness that goes on on them. But this time it was too good, so I sent it to Wendy, and she sent it to me almost the exact same time because she saw the same thing I saw. And it’s so important to understand what’s going on on the people side of this. So Wendy, do you want to just kind of read the initial post? Is that the best way to talk about that? Yeah. You bet. So the initial post was posted by a hygienist. And I’ll summarize it. I’m not going to read it word by word. But the hygienist was sharing a situation that had happened. She’d spent the last three years working on convincing an anxious patient that had been involved in the practice for more than 30 years about some amalgam fillings that were breaking down, broken, leaking, with surrounding tooth structure fractured with visible fractures. And the hygienist finally had the patient ready to schedule and get started. So when the doc comes in for the exam, she explained how they went tooth by tooth, intraoral camera, showed the patient how it needed to be replaced, and he looked at the patient and said, “Oh, these amalgams are holding up fine.” So the patient turns to the hygienist and said, “See, you don’t know what you’re talking about.” And the post was really about the frustration, right, because the team had had several meetings about production, replacing all broken-down fillings, restorative schedule’s been empty. And so they had this plan to really start focusing on these fillings, but this was a patient that was a good buddy of the doctor and so that was the reaction they got. So the post goes on to say how both the office manager and the hygienist gave their notice that day because they just couldn’t take that anymore. So she ended her post by saying, “Don’t ever make your hygienist look like a fool.” So that was the original post that caught my attention and your attention, as it happened. For sure. And this is something that we see so often, and there are so many pieces of this to dig into. So I’m just going to pick one, and we’ll talk about that. Then we’ll pick the next one. But one of the things is, clearly the dentist and the hygienist were not on the same page when it comes to treatment philosophy and how we communicate that. So clearly, the hygienist believed they needed to be done, and the dentist didn’t, so they were off there. And I see this a lot, particularly in practices that are struggling to keep their restorative schedule full, is that they’re not on the same page. The time hasn’t been spent to create a practice philosophy that everybody knows and understands. Right. Or if there is a practice philosophy that everybody knows and understands, sometimes her main frustration in this instance was from the fact that this was a friend of the doctor’s. So the needed work wasn’t discussed or wasn’t done and so she felt like it was an ethical quandary, right? So we may have a plan, but the plan is not consistently followed. And that can cause as much frustration as not having a plan in the first place. For sure. And so the lesson for doctors here, number one, is consistency is key because if you’re not consistent, it creates a lot of confusion for the team. And it’s hard to be consistent because your– I can tell you that doctors are more diagnostically assertive– consciously or unconsciously, they’re more diagnostically assertive when they aren’t running behind. They’re more diagnostically assertive at the beginning of the day rather than at the end when they’re tired and they’re fatigued. There’s lots of things that affect what doctors say. But that’s part of consistency, is being aware of the things that make you less consistent and making sure that you’re adjusting for that. Right. And the thing that we see, too, like you said, is that sometimes we can be having these discussions about what we want to do, but depending on the mood of the doctor or the stress level or the mental energy capacity of the doctor, it isn’t always followed. And, therefore, we need to have a plan for how the team reacts in those situations that isn’t offensive to everyone involved. A structure for communication is also missing here because really there was no need for the hygienist to give notice, right? There should have been a consistent plan for them to actually have a conversation about what didn’t work and right the ship, if you will, rather than just all bets are off, game over. Totally. Totally. So being able to have a frank conversation when expectations are not met either way, either direction, that’s such an important piece of having a high-performing team. Interestingly enough, Dr. John, I mean, there are still so many lessons we could dig in, but some of the lessons actually come in the comments, too, right [laughter]? Yeah. Let’s hear some of those. Yeah. Oh, the comments were all over the map, right? You had the people saying, “Well, that’s who I’d want to treat me as my dentist because just because they look bad doesn’t mean you have to take it out and do it all over.” And when I heard those comments, I went back and read the original post, because I wanted to see a little bit more information about why she was recommending replacing those fillings. “The fillings were over 30 years old, broken, leaking, with surrounding tooth structure fractured.” So the comments from dentists saying, “Well, that’s the kind of dentist I want to go to, because I don’t want– even if they don’t look good, they don’t need to be replaced.” But the language was, “More than 30 years old, broken, leaking, fractured.” And I don’t know very many dentists that wouldn’t think that it’s time to do something, right, when it’s broken, leaking, or fractured. So I think having clarity on definitions is really important. But some of those posts were funny because they were focused in– they dialed in on– one even used the language, “An egomaniac hygienist,” which I found funny. When I read stuff like that, it just drives me crazy [laughter] because I just can’t believe people would take what that hygienist said and saying that she’s somehow wrong or awful. I mean, I can’t get that mindset. Well, and there were a lot of people saying, “You’re not a dentist. If you want to diagnose fillings, go to dental school.” But what they missed was in her post that they had had team meetings about it, that she was actually following the direction of the dentist she was working for in when it’s appropriate to replace fillings. She actually said this is after several meetings about replacing all old, broken-down fillings because the restorative schedule has been empty. So she was just following the direction of her dentist with these suggestions. She wasn’t making a diagnosis. So we often differentiate between the two things. Hygienists are there to support the diagnostic assertiveness of the doctor they’re working with, and so that’s part of our role. And we teach phrases like, “I’m not the doctor, but here’s what I see,” or, “I’m not the dentist, but I’ve been working with him a long time, and when he sees this, usually he does this,” or, “I’m not the doctor, but in this situation in the past, this is what she’s recommended for you.” So we’re using language like that, which always gives the dentist a back door if they don’t agree. But in reality, when this is done well, the hygienist’s job is not to make the diagnosis, but the hygienist’s job is to follow the direction and the guidance that they are given from their dentists. For sure. Yep. So with this, there are certain steps in ensuring that this doesn’t happen. Number one, making sure that everyone has the same treatment philosophy, making sure that there’s open communication, making sure that there was a communication from the hygienist to the doctor ahead of time, right, that she had discussed the treatment. Did the doctor know that? And if the doctor knew that and then, basically, undermined her, I can imagine she’s pretty upset because I would be, too. And here’s the reality, is once you do that with people, they aren’t going to stick their neck out. 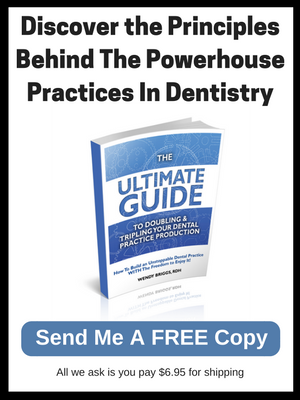 When you do that with hygienists or assistants, when you make them look bad in front of a patient, they’re not going to stick their necks out anymore to suggest treatment, which means now the amount of treatment presented goes down. Now our consistency on how much and when treatment is presented goes down and that the patient is the one that suffers. Right. And interesting that you would say that, actually, John, because I want to read verbatim another comment from another hygienist because this supports your point, and we see this time and time again. And I hear it from hygienists, right? I mean, we’re the advocates for the hygienists in practices, and as part of our role as hygiene coaches is, we try to help hygienists through any obstacles or struggles that they may be having. This is exactly what this poster said, “And this is exactly why I no longer say anything to patients. The only thing I’m willing to say is, ‘I’m going to have the dentist look at a few areas.’ Even though we get talked to and doctors are complaining about production all the time, I can’t care more than the owner and associates do. It’s not worth my sanity.” So that’s exactly how some hygienists respond. They just retreat and they quit having conversations because they don’t want to be wrong. Yep. And you can’t blame them. That’s exactly what human beings would do. So the lesson here is, you’ve got to have clear understanding of what we do, when, right? Make sure that everybody understands that these are our treatment philosophy. This is our treatment standards. You’re fine to go ahead and talk to patients about these things using the language you just mentioned. “I’m not the doctor,” for instance, is a great phrase to make clear that the doctor is the one doing the diagnosis and the only one that can legally and should be doing the diagnosis. Right. And patients respond to this in a really interesting way. So Dr. John, we say we teach that language to hygienists all the time, and they’re the ones that are kind of preheating the patient, right? And often, when the doctor walks in and confirms after a solid handoff, the patient looks at the hygienist and says, “You were right. You got it. You nailed it. She’s really good.” These are all things that the patients say. So in a way, the doctor’s final diagnosis really becomes, in some ways, like a second opinion, right? They’re confirming the initial findings, and it’s powerful when it’s done well. We’ve seen it do amazing things in practices that have really worked on these systems. Yep. So clarity on what we’re going to diagnose, clarity on how we’re going to communicate, and having the mutual respect between the hygienist and the doctor to when we don’t connect and our views don’t line up. We have to talk and figure out why. What happened there? Was I off on this? Were you off on this? What do we do to get better so that we can have more clarity, more consistency and better patient care? Right. And we’ve created a variety of tools and a process. We teach teams to do this, and we think you need to work on this every single week. We often say it’s a trendy thing in practices to do a throwback Thursday or something. We often will say, “Do a treatment-planning Thursday at your morning huddle and throw up a picture and talk about it and talk about language. What would you do here?” See if the hygienist can accurately predict what each individual doctor’s going to say because as complex as the structure is, it becomes even more complex when you’ve got multiple hygienists, multiple doctors all working under the same roof or when you have multiple practices all part of the same entity. So it becomes something that needs to be consistently worked on for it to happen and work well. Just like everything else, it doesn’t stay good on its own. You’ve really got to work on it because it’ll drift back to habits. It’ll drift back to what’s easiest. But having clarity, great handoffs, is such a powerful, powerful tool on getting patients to accept the care that they want and need. I so agree. So Dr. John, let’s say we have listeners that have really not worked on this and they really don’t have a process or haven’t discussed language to really talk about dentistry or dental care, restorative care at all. And frankly, this is so common, so don’t feel bad if you really haven’t thought about this. I always tell the story about I’d go fill in or temp, sometimes even with a new job, they’d say, “There’s your room. There’s your instruments. Ready? Go.” And that’s really all you’ve got to get started. 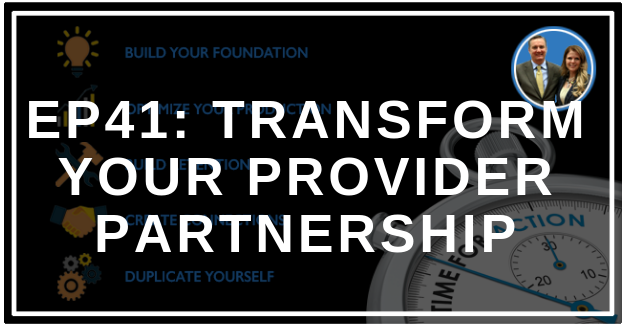 So this is something that’s not uncommon that dentists and hygienists haven’t really taken the time to talk about this treatment-planning partnership that’s so important, but it’s often overlooked, or it’s not something that we know how to impact. And so sometimes in some practices, it takes years before we really get good at accurately predicting what our doctor is going to say. Well, we always say you don’t have to wait for years and years to build that relationship. You can facilitate that process, but you have to work at it. So how would you say what’s the best way for people to get started, Dr. John? Well, the first way is, number one, the doctor getting clearer on what their treatment philosophy is, so everything from having a radiograph policy to having a preventive policy. When do we do sealants? When do we do fluoride? When do we do desensitizing? That we have a perio strategy. When are we going to diagnose? What does it look like? What do we talk about? How do we talk about it? So really getting clear exactly what your clinical philosophy is and making sure that you can describe that to teams. The second thing that I think is important is, once you have that philosophy, how do you talk about it with patients so that everyone uses the same language? Because if the language is different from person to person in the office, the effect on the patient is confusion, and confused people don’t move forward with treatment. I couldn’t agree more, Dr. John. And that was interesting because years and years ago when I first came in to your practice, that’s one of the things that we focused on, we worked on, was establishing what we call tribal language, right? And three terms that I learned years and years ago from Gordon Christensen still prove very powerful today. So we often teach in our complex treatment-planning courses– of course, we’ll spend a lot of time talking about three terms that are very powerful tribal language to have when we’re talking about treatment, and that is mandatory, elective, and cosmetic. So why don’t we do this Dr. John? Why don’t we go ahead and include a tool that we use with our members to help them get clarity on what their definitions are for mandatory treatment or elective treatment or cosmetic treatment? Let’s include that on the Double Your Production podcast homepage as a free download. And that will help them at least get clarity on what language to use or which words are appropriate in their practice, given their doctors’ diagnostic assertiveness and treatment philosophy, so they can at least start with that. Yeah. That’s awesome. Very good. So this takes some time. It takes some time with your team. It takes some thoughtfulness on yourself. Often, when you start doing this, you’ll find that you haven’t been, doctors, as consistent as you may have thought you were. Some of these things might be a little fuzzy for you to write down and make clear. And if that’s the case, if you’re not clear, you know the team doesn’t have a chance of being clear. So this is a great exercise, and I encourage everybody to take the time to do it. It’ll pay off dividends first and most importantly for your patients, but second of all, for the practice success as well. I couldn’t agree more. This is such a powerful component, and we do see so many practices that work at this really transform their performance in this area. And let’s take just a minute and talk about what we see in this area. I mean, who wouldn’t want higher case acceptance, better clarity, less doctor time during exams? Those are just a few things I’m thinking about that come with working on these systems, right? I mean, I’m sure you could probably name a few more, Dr. John. Yeah. But that’s a good start, really. Great. So to get that tool, remember you can just visit the podcast homepage. So you’d find that at the teamtraininginstitute.com/doubleyourproductionpodcast. Or you can just google Double Your Production podcast and it will come up. So you can find that home page, and there should be a very easy button for you to download that tool, and we’ll have that loaded there for you to begin this process because again, we’ve said it time and time again, practices that spend time and effort working on these systems really do realize a very powerful boost to their practice performance. For sure. And it’s so easy when done well. Then no one needs to go on social media and write a lengthy post about quitting their jobs because they didn’t have doctor support, or doctors don’t need to go on social media and complain about how their hygienists [laughter] never preheat the dentistry that they’re restorative for them. If I had a dollar for every time somebody’s complaining about that, right, Dr. John? Isn’t that the truth? Yeah. Remember, that’s part of the practice’s reputation is what your former employees say about you. So we’re in the reputation-trust business, and so we want to make sure that we aren’t leaving people out there saying things like that about us. All right. Very good. So with that, we’ll say goodbye until the next episode of the Double Your Production podcast. Thanks, Wendy. 2. 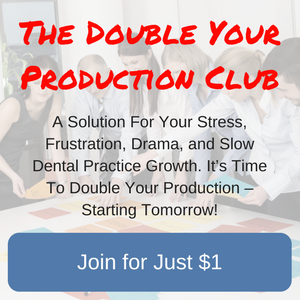 All listeners of the Double Your Production Podcast, can test-drive our Double Your Production Membership where you have access to the trainings, videos, and live Q&A’s with both Dr. John and Wendy. Check it all our for just $1. Click Here to See Everything That Is Included. 3. Worksheet about Mandatory Elective and Cosmetic treatment planning– FREE to you as our podcast listener! Get one Here.